Welcome to the best city in the world, Orlando. This Orlando, Florida budget travel guide for has practical tips for enjoying the City Beautiful on a budget. When I graduated college in 2013, I moved to Orlando for the best internship ever, The Disney College Program & then stayed here after so as a Floridian and previous Walt Disney World castmember and Universal Orlando team member I have tons of expert tips for visiting Orlando on a budget. So I’m going to cover everything you need to know in this expert travel guide to visiting Orlando, Florida on a budget. I will blog about visiting Disney World and Universal Orlando on a budget in a separate post, otherwise this one would be super long. First things first, when planning your trip to beautiful Orlando & trying to find cheap flights to Orlando it is important to know that there’s more than one airport in Orlando, so depending on which airline you are flying with you may not be flying into the main airport, Orlando International Airport aka MCO. Most airlines fly to MCO, but a few budget airlines only fly to Sanford Orlando Airport aka SFB. These airports are about 45 mins from eachother, and while the flight may cost a little less to use a budget airline & fly into SFB you really want to weigh your options because SFB is pretty far, plus flying into MCO has a lot more perks and benefits, including free transportation to Walt Disney World hotels. MCO is also centrally located in Orlando making it 20-24 mins from Downtown Orlando, about 20 to 30 minutes from Walt Disney World, about 20 mins from Universal Orlando Resort, and about 15-25 mins from I-drive. SFB is about 50 mins from I-drive, so that should tell you how far it is. Quick tip: If you’re wondering why the estimated times of arrival have such big gaps: tolls. But, I’ll tell you how to beat those pesky Orlando tolls later in this post. The weather in Orlando is always perfect. (Be prepared to hear me sing the praises of Orlando this entire post, ya’ll. I love Orlando) You know how the rest of the country has seasons like winter, summer, spring & fall? Well, Orlando doesn’t really participate in that. We have 2 seasons. Can you guess what they are? Hot & hotter. Even though I’m a Floridian now, I am originally from Ohio so when I took my first trip to Orlando as a kid I fell in love with the weather. But, our perfect weather, plus the endless amount of things to do here, brings us constant tourists ALL. YEAR. LONG. So the best time to visit would be when everyone else is at work and school (so try to avoid spring break, summer break & the Holidays). I’m not saying it wont be busy during those time, it just wont be as busy as it usually is. The best month to visit Orlando is September, the humidity isn’t as bad (still hot, though) the lines at the theme parks aren’t as long because everyone has gone back to school/summer vaca is over, plus with tourist numbers being lower around this time hotel prices are also lower. Plus, there’s typically discounts in every category from dining to attractions floating around during this time. Depending on what you’ll be doing and how long you’ll be in Orlando the transportation method I recommend will vary. If you’ll be in Orlando for a while and plan on going all over the city and surrounding areas then I definitely recommend getting a rental car. Taking an uber to and from the airport alone can run you about at least $60 roundtrip (that doesn’t even include the price of taking uber everywhere else you’ll be wanting go during your trip). For that price you can rent a car for an entire week, but beware of tolls! Orlando tolls are not cheap and they are EVERYWHERE! I recommend either programming your GPS to AVOID TOLLS or purchasing your own sunpass from Walgreens so you can just drive right through the toll booths without having to stop and pay the attendant or machine. Avoiding tolls will take a few mins longer, but it’ll save you money in the long run. If you’re coming to Orlando solely for Disney then I have good news for you. First, make sure you fly into Orlando International Airport (MCO) when coming to Disney because this airport offers a free shuttle, The Magical Express, to and from all Disney World hotels. Walt Disney World also provides free shuttles between all of its hotels, theme parks, water parks & Disney Springs, so a car isn’t needed at all if you’re only coming for Disney. There are tons of places to stay in Orlando. If you’re traveling with a big group then truthfully an Airbnb or a vacation rental would be your best bet. 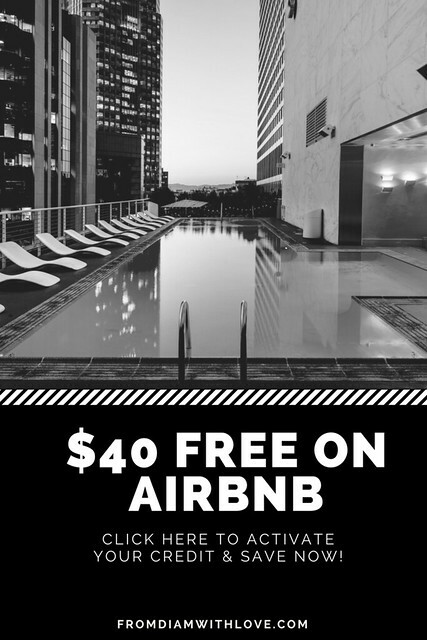 Even if you aren’t traveling with a big group, Airbnb is a good way to get the local experience by booking an entire house or a private room! You can sign up with my referral code & save $40 off your booking instantly! If you’re coming for Disney then I definitely suggest staying at one of the many Walt Disney World hotels. They literally have options for every budget. They are broken up into value resorts, moderate resorts, and deluxe resorts. The good news is that it’s still Disney and even the value resorts, which are not expensive at all are beautiful and you still get access to all of the perks including Extra Magic Hours, The Magical Express shuttle, & the option to book your fast passes 60 days in advance. Click here to view rates & save even more on Walt Disney World Hotels. Foodie tip: While in Orlando there are a few things you MUST eat. You HAVE to get a Dole Whip from Walt Disney World and a Butterbeer from Universal Orlando. Also get the Big Pink Donut from Universal, it’s huge and delicious. If you’re coming to Orlando for any of the theme parks ALWAYS check online because often times you can save money by purchasing your tickets in advance online. Plus it’ll save you some time from waiting in those long ticket lines. When most people think Orlando they immediately think theme parks, especially if you’re a 90’s kid like me. But theres so much more to do beyond the theme parks. There’s tons of shopping & malls: Millenia Mall, Florida Mall, Orlando Premium Outlets, Orlando Prime Outlets. If you visit during basketball season it is worth it to go to an Orlando Magic game. The seats are pretty cheap and the games are so much fun! & If you’re looking for a beach Orlando is only an hour from Cocoa Beach, Daytona Beach, & New Smyrna Beach. Speaking of beaches, Orlando is only about an hour or so from Port Canaveral which houses big names like Carnival Cruise ships & Disney Cruise ships! There’s almost always sales going on, so I definitely recommend looking at cruise options since it’s nearby! I’ve taken a couple cruises from Port Canaveral with Carnival and they were so so so fun! What’s your favorite tip for visiting beautiful Orlando on a budget? Be sure to share, tweet & pin this post! This post contains affiliate links. If you click a link I will receive a small commission at no additional charge to you. I love the tips for doing things on a budget in Orlando. I grew up in South Florida, I am looking forward to more Orlando trips in the future 🙂 I gotta pin this so I can reference easy later. Wow, you really do have plenty of experience navigating Orlando on a budget! And great point about the tolls. I also forget to budget post-flight fares when I’m planning travel. Next time I visit, I’ll swing back by your blog to get the experts advice! Beautiful photos and great tips! Thanks so much for sharing your knowledge! Now following so I don’t miss your posts! Um, just like with circuses and zoos and amusement parks, I’m afraid I’m the kind of person who would need to be hogtied and kidnapped to actually go to Orlando. Which means that I enjoyed your post even more than a Normal Sane Person would! I really enjoyed your ‘visit’, especially the gorgeous photos. Thank you!!! I have family there… one day we will visit! This was handy to know – I’m looking at the International Disney College Programme or simply going to work at Disney in Florida for the season. So all these things are good to know – I’ll also pin this so I can find it later! Cool! I also did the Disney College Program so I definitely recommend it!!! Thank you! looking forward to reading your post! I did the DCP just one year after you! I never wanted to leave and always wish I was back in Orlando. Omg really! Where did you do your program? I think everyone that does the DCP never wants to leave. Best time of my life! I did my first half at QSFB in Hollywood Studios and then I did retail in EPCOT for the second half! I did mine at Hollywood Studios too!!!! My favorite budget spot in Orlando is the Victoria’s Secret outlet store. My 2nd favorite would be the Nike Clearance store in Kissimmee. There is the Wat Florida Dhammaram very close that is a good cultural experience. I also like Leu Gardens. YES!!!! you are speaking my language haha That is literally my favorite perk of living in Florida. The prices at the VS outlet are AMAZINGGG!!!! I am so glad that I found your blog! We are currently planning a Disney World trip and my mind has been spinning!